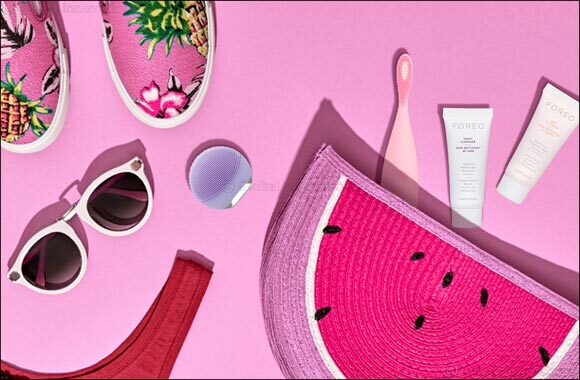 FOREO delivers the ultimate festival survival kit for a glow-on-the-go. Tried and tested at Coachella opening weekend! United Arab Emirates, 18th April 2018: The first weekend of Coachella may be over but there’s still more to come, as well as a flurry of summer festivals on the horizon! So, if you’re starting to ponder about how all the super-chic festival goers, including the fresh-faced celebs and influencers stay looking their best, whilst living their best life, then FOREO is here to help you put on your best festival face forward this season. Yes, it’s possible to maintain your glow-on-the-go with limited sleep thanks to FOREO. The Swedish beauty brand fled to Coachella to give you the ultimate guide to festival face survival, tried and tested by influencer sister duo Hadia and Layla Ghaleb with FOREO passport in hand, met by a room filled of balloons and boxes filled with surprises! “The three days of Coachella have been some of the best days of my life. I'm super happy I got to live it with my FOREO fam!” - Hadia Ghaleb. In case you missed it, check out the highlights on the @FOREO_MEA Instagram account and here’s the scoop on all the essential products for festival fans this season. Get ready to take note. That festival glitter doesn’t come off by itself! And after a day of dust, dirt, sweat (yes its’ not all glam) plus a whole lot of make-up, it all needs to come off - even if it’s the morning after. If you don’t want to compromise that glow then the LUNA go is going to be your best festival friend. Why? Because you can literally take it anywhere! It’s no larger than a cotton pad, perfect for packing and slipping into that cross body or belt bag this season, which means it’s totally travel friendly and its long lasting charge makes it easy to use, anywhere, anytime. The T-Sonic pulsations vibrate, so your skin will feel fresh daily removing 99.5% of dirt and make-up! “Couldn’t have gone through the heat and dust without my LUNA go.” - Layla Ghaleb. “Today marked one of the best days of my life all thanks to FOREO! I (sang) screamed my lungs out when Beyonc� took the stage and joined her as surprise guests JayZ and Destiny’s Child! Meanwhile the LUNA go was with me throughout the whole day to help me beat the desert dust and heat!” - Hadia Ghaleb. Pack your favorite cleanser or grab FOREO’S Day & Night Cleansers specifically customized to meet the skin’s day and night-time with transformative textures and unique formulas. Wake up and illuminate after a long night of partying to Beyonce and detoxify and cocoon before your head hits the pillow. No festival selfie is complete without the perfect smile! Hence you’ll be needing the ISSA 2. With 11,000 high-intensity pulsations per minute it breaks up & removes plaque and lasts an entire year, 365 days, on just one single charge! The ISSA 2 is entirely made out of medical grade ultra-hygenic silicone, meaning less bacteria and better oral health for even the most extreme festival conditions. It’s also quick drying meaning you can pop it straight in your bag and carry it with you on the go so you’ll have a dazzling smile from day to night! “Going to Coachella with FOREO was one of the most exhilarating experiences of my life. Definitely one for the books.” - Layla Ghaleb.